Charlottesville, VA — March 15, 2017 — Although he’s earned many titles and honors for his advancements in molecular research, Brooks Pate sees himself first as a citizen-scientist. The University of Virginia’s William R. Kenan Jr. 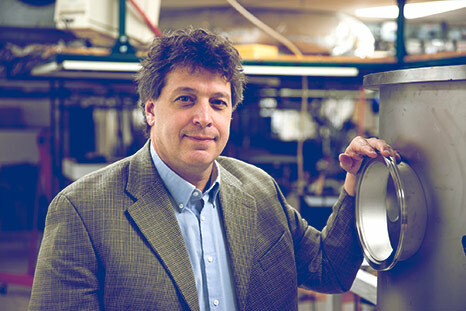 Professor of Chemistry is committed to conducting basic research for the public good. In recognition of this work and his commitment to research for public benefit, the Licensing & Ventures Group named Pate the 2017 Edlich-Henderson Innovator of the Year. Before the award was presented Thursday, UVA Today spoke with Pate to find out more about his research and how he views scientific research as a civic duty. A. The field I’m in is physical chemistry. It’s about trying to make sure we quantitatively know what structures of molecules are and how those molecules react to form new molecules. A lot of what we do is look at areas where theory is on the forefront, where they’re really developing new tools to predict the behavior of molecules and matter and then look at what needs to happen in the lab to provide test data to make sure that theory is on an accurate path. Our side of it – although I have worked a little bit on the theory side – has really been creating new scientific instruments to advance molecular measurement in larger, more complicated systems. That’s always been the challenge for us – the basic science pursuit of how to advance the firm understanding of the way molecules behave. Q. What are some examples of how that molecular measurement is used? A. We really are focused on extending the applications of our technique towards chirality issues. The chirality of a molecule refers to a subtle difference in geometry. For example, two chiral glucose molecules are made up of the same number of carbon, hydrogen and oxygen atoms and have the same distances and angles between these atoms, but they are structured as mirror images of each other, not exact copies. One is “left-handed” and one is “right-handed.” Chemical reactions within the human body can be different depending on whether the molecule is left-handed or right-handed and that difference is important for the efficacy and safety of new drugs. My field of physical chemistry has produced the first new approach in well over a decade to measure the handedness of molecules. We are developing technology for chiral analysis and know already that this has important applications for the development and production of pharmaceuticals. Q. What do you believe are the largest challenges facing modern scientific research? A. I’ve become concerned that not enough people understand the social contract scientists have in this country. The idea of that contract goes back to a very famous document called “Science: The Endless Frontier,” commissioned by President Roosevelt and written by Vannevar Bush. It came out just after World War II and Bush’s argument is that basic research builds knowledge that enables large advances in technology and spurs the creation of jobs, improves health and makes it possible to create products in less time. For that reason, he argues, it is important that the public invest in basic research. This report led to the creation of the National Science Foundation – the agency that has supported the instrument development work in my laboratory. Pate was named 2017 Edlich-Henderson Innovator of the Year in recognition of the advances he’s made in molecular analysis. Prior to World War II, there was very little public funding of basic research. That document set out the pact to support it. Essentially that pact is, “We – the public – will pay the scientists to do the work the scientists want to do because we think it’s going to have an impact on society. In exchange, when the scientists discover something, it’s their responsibility as a scientist to bring that out and commercialize it.” That model is really important to how we think about science, so I’m happy that my work follows this vision of basic research advancing the public good. It’s not always easy to explain to people what I do in my lab and why they should care, but this pact is why. My research has broad applications and what can come out of it are advancements like the techniques we helped uncover to create more effective pharmaceuticals. Q. How do you bring this scientific pact into the classroom? A. I try to make students understand that it’s fine to pursue basic research – it’s the most fun thing you can do if you’re of that mindset of just solving problems every day – but you have to understand the contract you have with the public to get that information out in some form. That may be through education or by making sure that new innovations are brought to the public market – that involves working with places like the UVA Licensing & Ventures Group to protect intellectual property and help spur further development. I also come from a family of public servants. My father worked for the National Security Agency, he was a career public servant, and my mother was a public school teacher. I was raised in the environment that having a job that helps your fellow citizens is a privilege and you need to do it as well as possible. So I try to pass on that mindset to my students, both at the undergraduate and graduate level. BrightSpec delivers solutions for identification, quantification and structure analysis of complex chemical mixtures for applications in R&D, pharmaceuticals, fine chemicals, food, and advanced manufacturing sectors. BrightSpec received research funding from the US ARMY and the National Science Foundation, and the Virginia BioHealth Research Corporation. For more information, please contact Justin Neill (CTO) or Bob Lloyd (CEO) at 434-202-2391, or visit www.brightspec.com.